There are certain things you come across in life which leave you with nothing but a stunned mind and silence. Poems of Gitanjali is one of these things. With the onset of Diwali cleaning, my mother was busy clearing out her bookshelf this morning. Like every year, I went and plonked myself beside the huge stack of books and started going through them in the hope of discovering something new. This unassuming cover was just lying within the mess, content in its own being. I picked it up, and flipped through the pages to find verses of uncluttered poetry. Curious to know more, I started reading the Forward and the Introduction to the book. Gitanjali was a young girl diagnosed with terminal cancer at the age of 14. She was a simple girl, from a simple family. She fought this humiliating disease for 2 years, until finally succumbing to it a few days after her 16th birthday. Since she spent most of her time alone in her room or the hospital, she would write poems. But surprisingly, she would hide all these poems she would write in the most improbable of places. She would scribble a few lines and hide it within her pillow cover, the sofa cushions, behind books, wherever she could reach. The reason being that she didn't want to hurt her family by letting them know of her pain, through her words. Gitanjali wrote innocent poems about the stray dog in her building, her new birthday dress, the bird she'd share her breakfast with - they are the kind of poems which would leave you with an after taste of bittersweet melancholy. But more than that, she wrote extensively about life as well as death. The kind of poems she had written between the ages of 12-16 are heart wrenching, yet uplifting at the same time. This particular one absolutely stunned me. The clarity this sweet young girl conveyed through her poems, will really leave you with nothing but silence. Standing in the midst of this rat race of ours, the rats never seem to get enough of running around. The increasing pace with which the rats are on the move, it would make their ancestors at the Karni Mata Temple proud to the point of indifference. The young ones always seem to be running to and fro from coaching classes, the students are perpetually on the move to increase that one mark & add that extra point on their CV's while the working class is on a voluntary session of their own personal hamster wheels. Sometimes I wonder, when do they all sleep? I know they don't holiday. I see everyone, everyday. The average cut off for every college keeps rising everyday, getting a job after a degree seems a lost cause with impressive resumes on every alternate lap and the AC buses are perpetually crowded with professionals crawling back home. And boy, do they enjoy their life. Don't try to defend them, I saw them celebrating. I know what I saw. I saw them sleeping off on their books with a pencil in hand, I saw them dozing off in lectures, and I definitely saw them catching a power nap during lunch. It all looked quite joyous. After all this joyous celebration, they have the audacity to come up to me and complain about how they aren't happy, about how they'd rather be doing a different job, living a different life. This isn't going to be yet another post saying - Be different. Quit your job. Paint. Yada. Yada. This is just a thought I had today. As long as we live in a wonderful country as ours, as long as we continue succumbing to the badly built social structure, and as long as we have that rude hand wake us up at the last stop on the train, this lifestyle might never end. And that thought scares me a little. The moment I stepped out of the Cinema Hall, I was welcomed by dark clouds and soft breezes. And of course, the hard pelting rain. The movie I had just finished watching was the Harry Potter and the Deathly Hallows - Part 2. There was nothing but an overwhelming sense of sadness, and nostalgia. When the first Harry Potter movie had released in 2001, I was in Class 5. I remember watching this movie in a single hall theater in Goregaon and coming out of it wide -eyed. I had been unfortunately unaware of the Harry Potter Series up until David Heyman decided to make a movie on it. Needless to say, I wasted no time on getting my hands on the four books which had been published up until 2001 and finishing them in a span of 6 months. I had begged, borrowed, and almost stolen any book I found remotely related to Harry Potter. As I write this, I can see a copy of 'Quidditch through the Ages' and 'The Magical World of Harry Potter' staring back at me amongst my copies of the actual series. But soon, it had all been read. And from then on, the wait began. The wait for the next book to be published. The wait for the next movie to release. The wait, that agonizing wait, can only be understood for the ones who grew up with Harry Potter. And once the book did come out, there would be a period of a week where you'd refuse to talk to anyone who got the book before you in fear that they'd reveal some secret to you which you'd rather read in the book yourself. Once you did get the book, you'd read. You'd read till your eyes were droopy and your mum yelled at you to go and sleep as it was 1 AM and you were only 13. And then you read, as soon as your alarm bell rang at 5 AM because you just had to finish this book before you left for school. You just had to! Then, once the movies came out, it was grander than our wildest imagination. Hogwarts was better than we'd pictured it, every character was just perfect, it made us yearn to reach out and gulp down a glass of Butterbeer. It even made us jump up, take out our wands, and fight the battle beside the Order. Irrespective of exams, health or weather, once a movie released, you had to watch it as soon as you could. It was just wrong to think otherwise. In the time where video games and television ruled, J.K. Rowling made kids fall in love with books again. For that, I'm truly in awe of her. For creating a world so enchanting, that people had no chance but to be drawn into it. A magical world, in every sense. In retrospect, I'm so glad that I discovered Harry Potter at the age of 12 and not 11. Else I can't imagine the kind of hell my parents would have to put up with, when I demanded them for an explanation of why I didn't get my letter from Hogwarts. The eternal Good vs. Evil story, that what is was. Yet it taught us so much more. It gave us so much joy, so much happiness, and also, so much pain. The little jokes, the inside spells, and the mischief managed shall never be forgotten. I don't feel bad that it's all ended now, that it's all over. I do however, feel horribly bad for the ones who missed out on Harry Potter and it's magic. I feel horribly bad, for I know there shall never be another series which can captivate me the same way as this story did. But I know, that every time I fall sick, every time I am sad and depressed, I can always plonk on the bed with a hardbound book, and relive that magic in my head all over again. I remember the first time I entered the book store to buy my first Harry Potter book. Chocolate always makes you do funny things. At the age of seven, I remember having belted the title of 'Toblerone bar finisher' under the 3 hour category. At the age of seven years and 4 months, I remember belting yet another title of ' Blue package Chips Ahoy digester' under the 'Unsupervised afternoon of watching Cartoon Network' category. Needless to say, at the age of eight, three cavities were discovered. In the eleven years since then, nothing has changed. Except the exponential growth in the number of cavities and root canals I harbor. But now that most of my teeth are actually just cement, I no longer have any guilt downing a bar of Bournville and then accusing my mother of not sharing any. 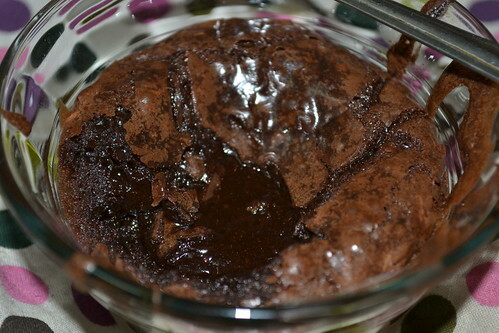 Today, I finally tried my hands on Molten Chocolate lava cake. The first absolute thing you need to do, is to get yourself some ramekins. Thanks to a wonderful post by the purple foodie, I realised Home Centre has stocks of ramekins. So, running to Oberoi Mall and slight pleas to parents landed me with these beautiful Pyrex ramekins. First things first, raid the utensils drawer. Find two bowls which just about fit one over the other. We need a make shift double broiler to melt the chocolate as always. 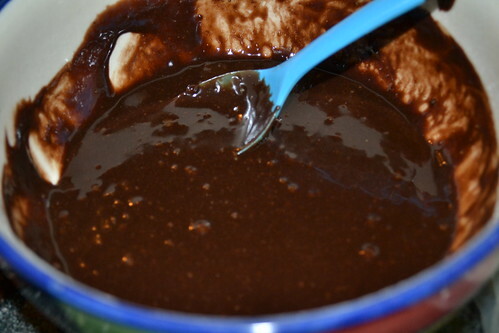 Fill the lower bowl with water, place the second bowl on top and dunk in all the chocolate bits. Switch on the gas. Low heat. 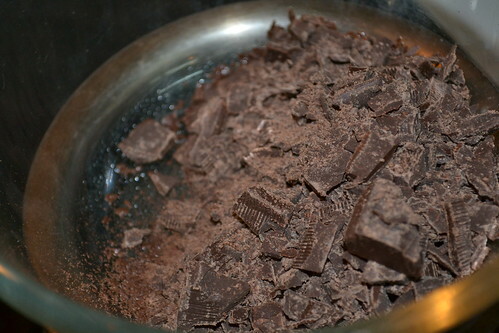 Once the water starts to boil, the steam starts melting the chocolate. Now, plonk in the butter. Sweet glorious stick o' butter. Now imagine a world where butter is used to bribe people. What a wonderful world that would be. There would be happy people everywhere dying of clogged arteries. Ah. Joy. 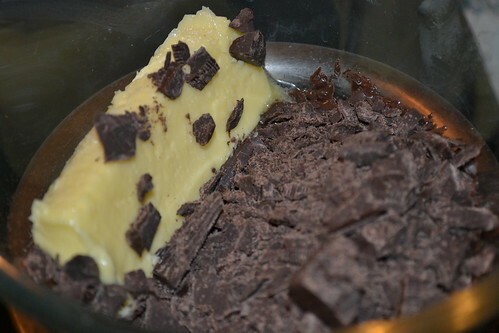 Once such happy thoughts are thought of, you will notice that the chocolate and butter of melted and combined to form the most sinful chocolate-y mess. Stir into the depths of the sin. Such beauty in this world. 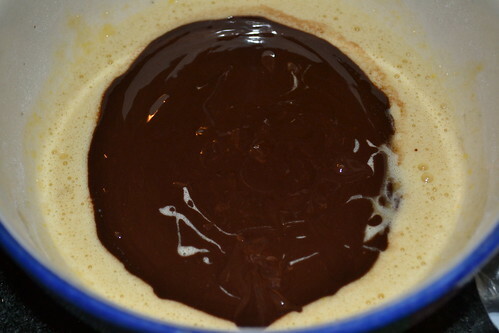 Take the bowl of the heat and let the chocolate cool for a while. In the mean time, pre heat the oven. at 150 degrees. for about 10 minutes. By now, its time to bring out the big guys. The big reassuring bowls, I mean. No no, please don't call out your burly elder brother. He'll do nothing except finish off the chocolate. Believe you me. 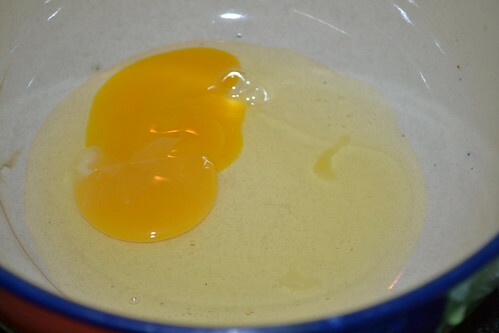 Break a egg into the bowl. Yes, the yolk is meant to be broken too. If you break the egg perfectly into the bowl, that signifies you have some unsettled childhood issues. No, really. 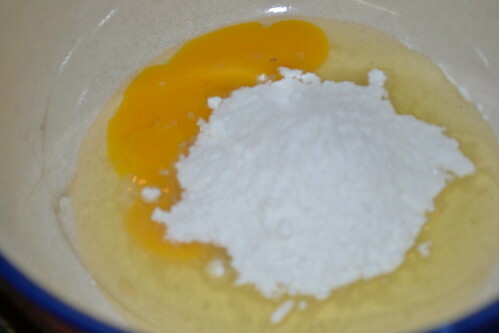 Dump in the sugar, and the flour. 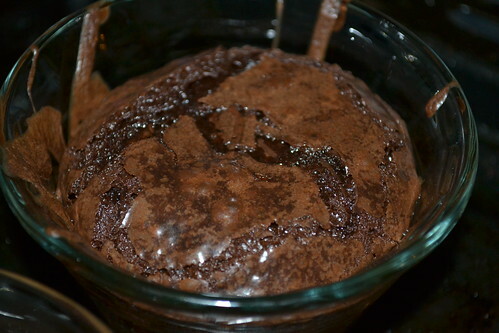 The reason we barely use flour is because this cake is supposed to be molten, and not very stiff cake like. Grab a spoon or whisk, and whip it. Whisk it yet again. 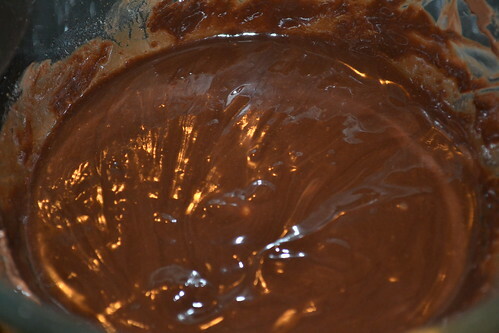 Now, add the now cool melted chocolate. Feel free to lick the bowl after. Make a occasion of it really. Light a few candles, play some Norah Jones and sit on the couch and slowly lick of all the excess chocolate. Unless you are as impatient as me, then you can go at it in the kitchen itself with chocolate dripping all over your shirt. Soon, you will see that the glorious chocolate will take over all. Chocolate wins, always. Its the cardinal rule. Pour the batter into the ramekins. Go on, taste the batter again. You know you want to. Now, place the ramekins in the oven. Bake for 20 min, at 200 degrees. You know when its done when the top is a bit cracked like this. The ramekins will be piping hot, so you need to be careful. These are one of those times in your life which your grandfather spoke to you about. A time when you have to exercise some serious patience. Like the few minutes before you can access your CAT result, or the moments before you can dig into hot chocolate gooey mess. It's the same thing they talk of. Once it cools down a bit, the surface will fall a bit. This is it. Go go go! Attack with the spoon! 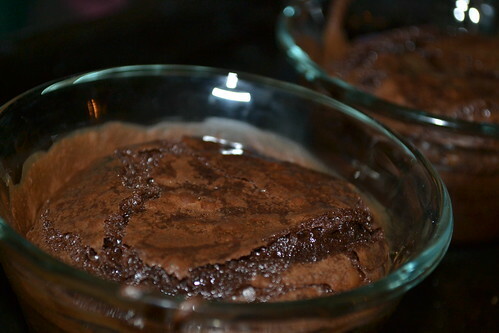 And then you dip in your spoon, and this bit of cake and this molten mass escapes. The joy. 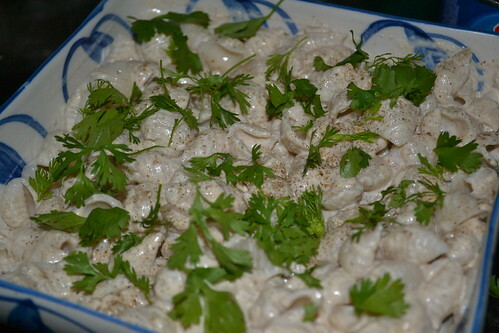 Earlier that evening, I had tried my hand at a Pasta with a Walnut sauce. Despite my high hopes on this recipe, it was just barely okay. Which got me down a bit. 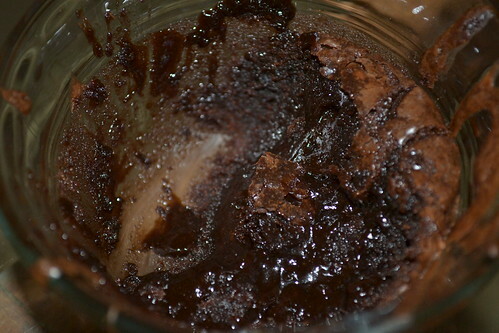 But then, molten chocolate came along and filled the void in my soul. It gave me hope. Hope that one day, an intriguing pasta recipe will turn out delicious. And hope that one day, I will click my food photos in natural light. Yet another year rolls in. Hopefully, I shall make this year count. 2010 was a good year in a lot of ways. A detox year, a year to reflect, a year to learn, a year to implement and of course, a year to start all over again. Something which will stick with me for a long time to come. Not because it needs to, but because I want it to. I spent the last day, of the first year of the second decade of the 21st century, cooking dinner for my parents. (because I am cool like that :P ) And personally, I think it was a good way to end the year. Like every year, I sat with my parents around the TV till 12, munching on delightful grub. But the most amazing thing I realized that day? 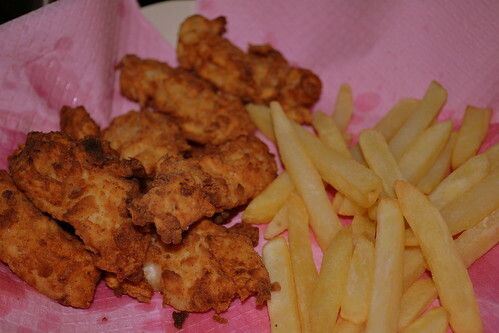 Fried chicken will always be one of the greatest achievements of 2010. It's right up there with clearing my structures paper, and convincing my parents that buying the camera was always their own idea in the first place. Surprisingly, the biggest hit of the night was the bread. It was THE bread. It was destined to be brilliant. 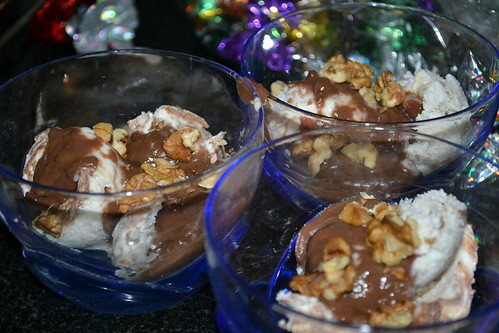 And the year ended with Vanilla Ice Cream with Nigella's Chocolate Peanut Butter Fudge topping. Ah, the sinful chocolate, with that hint of peanut butter. 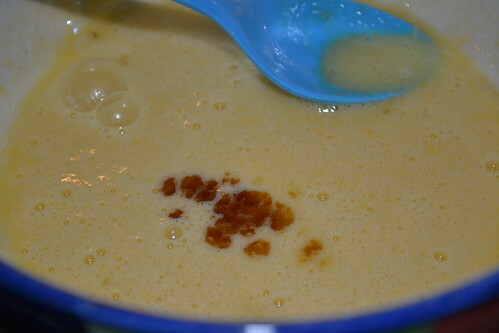 The smoothness of the condensed milk made it even more sinful. I beg you, to give this a try at home. I added walnuts too. You know, to make it a bit healthy. Because, *clears throat* I do care about health and stuff. In case you were wondering, the biggest portion is mine, yes. Well, moving on. 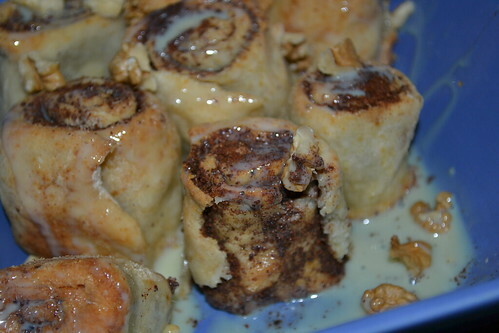 Today, I tried my hands at Cinnamon Rolls. Why you ask? 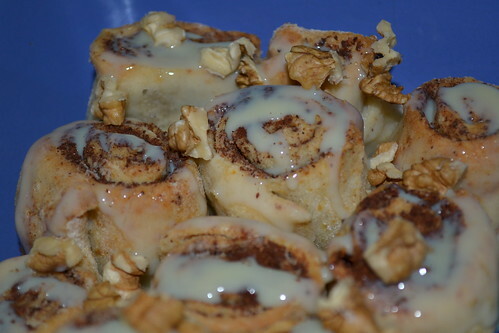 It's because I was recently introduced to the Pecan Cinnabon at Cinnabon. Its not just any kind of love. Its the 'I-am-obsessed-with-you-I-need-to-see-you-every-waking-moment' stalker kind of love.I've been floating since the first bite. It was like the Floyd of food. It is deep, and it takes you on a ride. Nothing more to it. So taking their tag line to my heart, I said to myself 'Life really does need some frosting!' and brought out the pots and pans and the yeast. Turns out, it is never a good day to bring out the yeast. Because yeast is evil. Also, because the kitchen hated me today. It kept rejecting me, how a body rejects a donated organ at times. Well, the yeast didn't rise the first time. I had to through the batter away. I dressed the scrapped knee, and I got up again to make a second batch. The yeast rose a bit the second time, but by then I was frustrated enough to say "Screw it, let's do this". Richard Branson ishtyle. Needless to say, because I was trying so hard to make and manipulate the rolls, I couldn't take no pictures. It felt like an MU paper really. Its that time when you are stuck in a compulsory question, you cant let the five marks go. You have to do something, so you pull, strain, rack your brains and you try all the tricks till you get a page of scribbled gibberish for the examiner to give you a pity 2 out of the 5. It felt exactly like that. They turned out pretty okay though. 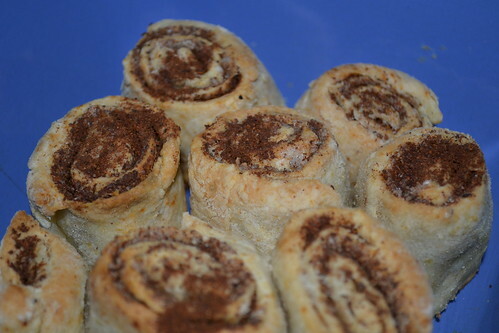 These are the bare naked Cinnamon rolls. A bit flaky, it needed more butter. Man, why did I skimp on the butter? Why God why?! Then my part two attempt to make Dulce Le Leche went out the window, because I had no time for the stove and microwaved the darn thing. And needless to say, the milk exploded and flew everywhere it possibly could. I took a bite, and it wasn't that bad. Even cooking has its rise and falls. You don't always get the outcome you hope you do. 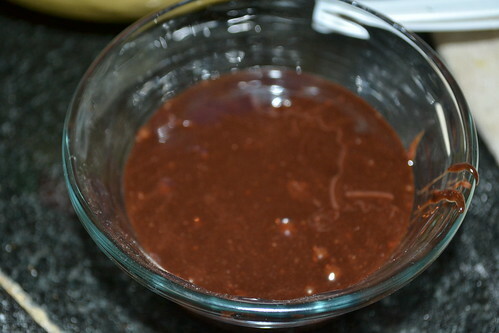 But, hopefully the next time I try this, I shall have more pictures and a steady recipe to follow. Till then, I'm off to sniff my dalchini rolls. Now Playing and bobbing head to - Tighten Up by The Black Keys. Now Reading - 'It happened in India' by Kishore Biyani. 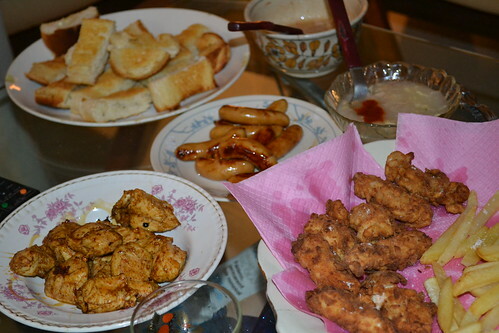 Now, Ashmita is also running a food blog - The Heavenly Hearth. It's her online cooking journal. She stumbles upon, she wonders, she chops, she sings, she cooks, she photographs and then she documents. Oh, the places you’ll go..